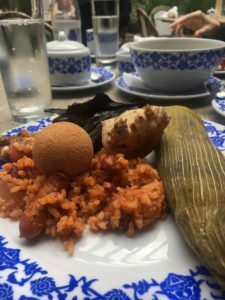 Having just returned from eating our way through Bogotá, Colombia, we are thrilled to share with you our ’72-hour Food Itinerary.’ We visited some incredible places including destination restaurants on Latin America’s 50 Best Restaurant List 2017 along with a couple other palate-pleasing venues. We have a tendency to gravitate towards tasting menus, so you won’t see the typical three-square-meals-a-day from us, but we assure you that the way we’ve structured this itinerary alternating between brunch and tasting menus, you’ll be more than satisfied (and full) all day every day. We found seven reasons to visit Colombia and they all reside in the gastronomic adventures that await in this mountainous city filled with deep history and beautiful cuisine. Nested in a beautiful cottage-like-hotel is the perfect restaurant for brunch! Executive chef-owner of CLUB COLOMBIA is Harry Sasson who is ranked No. 17 best chef on Latin America’s 50 Best Restaurant list for 2017. Chef Sasson also earned the ‘Highest Climber Award’ for 2017 as his crown jewel restaurant, HARRY SASSON flew up the charts from 40th position in 2016 to 17th in 2017. Equipped with outdoor seating and heat lamps, guests are sure to be comfortable in all types of weather. Club Colombia offers an ultra snazzy brunch-bar for grazing on traditional staples like rice, corn bread and tamales. Seated on the outdoor terrance on a brisk day, we warmed our palates with potato soup and coffee and were comfortably toasty. Not to be missed is the omelette station which offers up pico de gallo, Barbacoa and all the fixings to build yourself the perfect huevos (egg omelette). 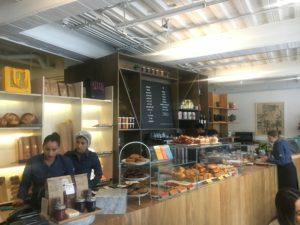 Harry Sasson’s CAFE COLOMBIA | the perfect place for brunch | tamales, made-to-order huevos. Note: Good news for residents of the USA, there is also a Miami, FL location. EL CIELO is an inventive menu prepared by Chef Juan Barrientos. His produce selection focuses on acidic fruits (other than lemon) with 70% of the ingredients sourced locally, but all from within Colombia. For example, in Bogota, no olive oil is used, only ingredients from Colombia. Because there is more than one location, the identity of each location is at the heart of the menu, so in Miami USA, the ingredient sourcing would be different. 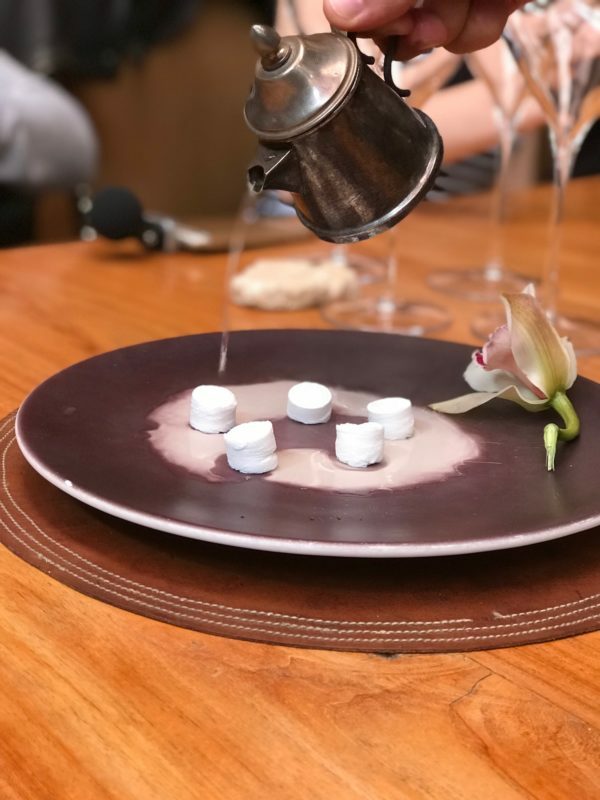 For this tasting, we enjoyed 13 courses using modern techniques meant to create special triggers – sensory moments, gastronomic moments, taste, touch and olfactory stimulation. Chef is very famous as a public figure with over half a million followers on his social media channels. He is causing the best kind of ripples with the support he lends to employing people with hearing disabilities and wounded soldiers. Chef Barrientos employs over 200 war veterans. 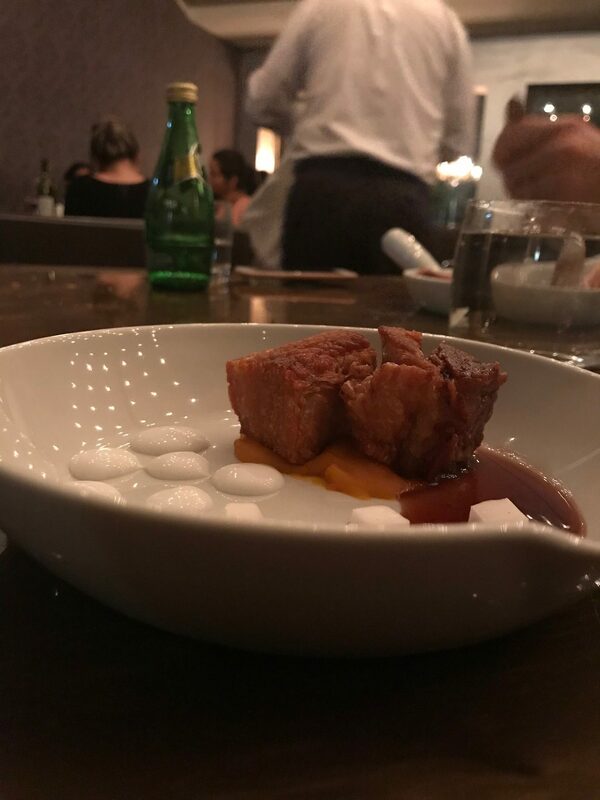 In line with his vision for bringing the best fine dining to all of Colombia, our senses were aroused and our tastebuds reveled in authentic Colombian ingredients thanks to the remarkable folks in the kitchen! The welcome course consisted of warm, silky chocolate drizzled into the palm of our hands then sprinkled with coffee-rub and sugar. 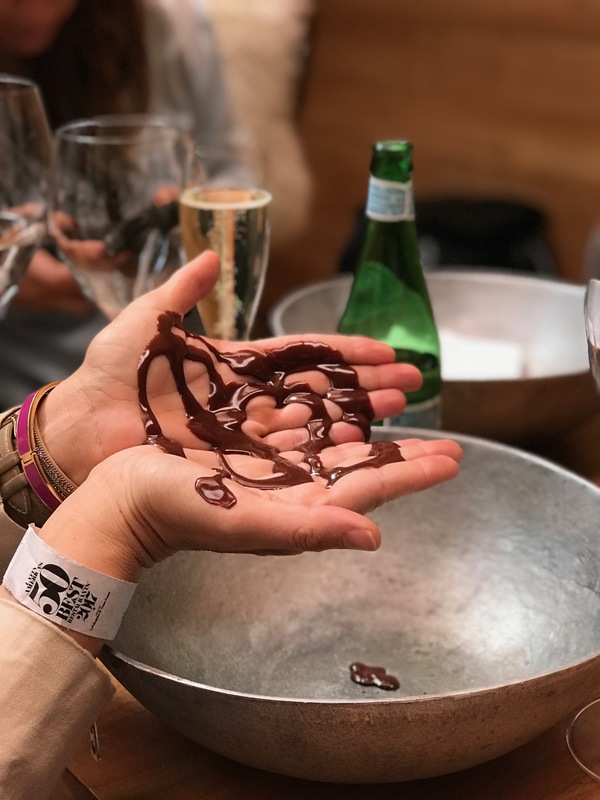 We were encouraged to lick the chocolate off of our hands and that’s exactly what we did! What a devious act at a fine dining restaurant! We loved it! You certainly don’t have to lick the chocolate, you can simply use it as a hand exfoliator and wipe your hands on a towelette. Unbelievably, we made zero mess. The staff is very attentive and they pour warm water over your hands to remove the chocolate while providing sufficient linens. Note: Upon first being seated, hand towels are provided for cleansing the hands thoroughly. Be sure to use the towels because once the first course shows up, you’ll be glad you did! 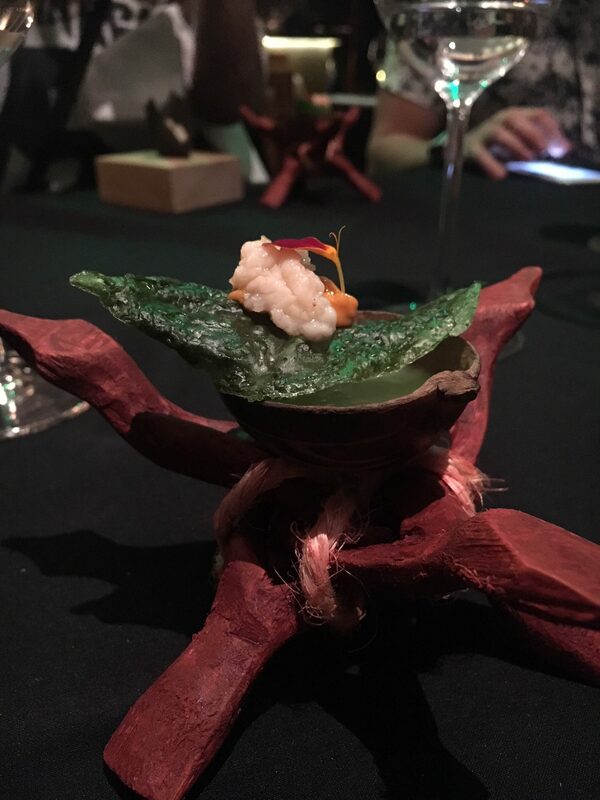 A sensory moment and a devious act for adults at a fine dining concept, EL CIELO. We fell in love! 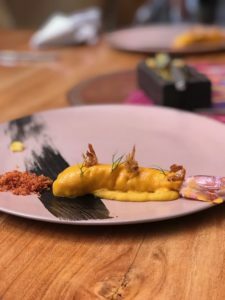 One of the main-course standouts was the ‘prawn soaked in carrot sauce’ served on a bed of potatoes with squid ink and sweet tomato dust. In addition to being flavorful and beautifully textured, the platings at EL CIELO were sophisticated works-of-art. Reason #3 ⇒Brunch at CASTANYOLES located within the Four Seasons Casa Medina. 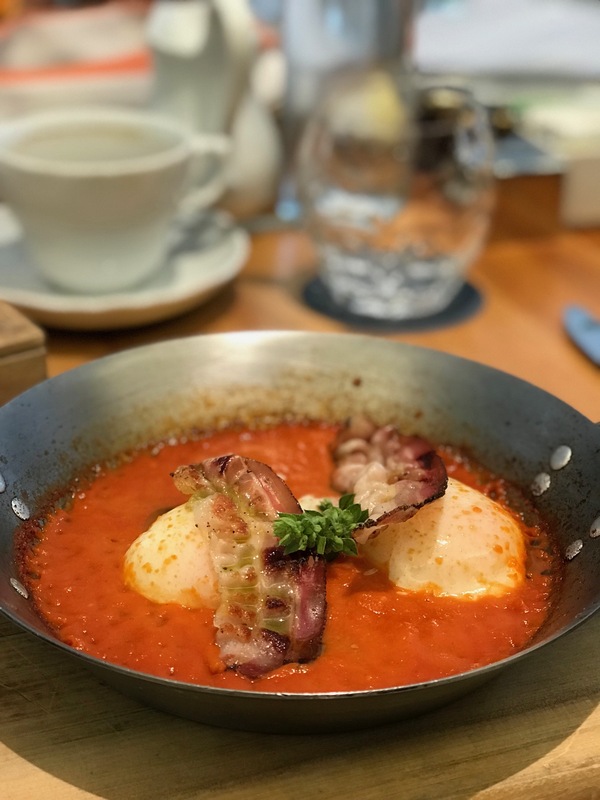 We recommend ordering the ‘Egg (in Camicia) with tomato sauce (Napolentana) and homemade bacon’ cured by Chef Carmine Esposito. The menu changes occasionally, so if this rotates off the menu, just be certain to ask the server what you cannot miss. They usually know best anyway. We typically inquire at all a la carte menus, by phrasing it “so, what can’t we miss?” Or in this case, “Entonces, ¿qué no podemos perder?” Often times, we leave our selection entirely up to our Captain. Nine times out of ten, we are thrilled and couldn’t have chosen better ourselves. Fine dining inside of The Four Seasons Casa Medina Bogota. Restaurant CASTANYOLES serves up eggs in tomato with basil & bacon. We also recommend going for the yogurt and cereal parfait while considering an order of mini doughnuts to take-away. If you opt for the doughnuts to be brought to the table, they show up in a beautiful wooden cigar box making for a great presentation. 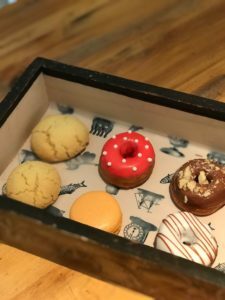 Beautiful display of mini-doughnuts courtesy of restaurant CASTANYOLES inside the Four Seasons Casa Medina. Make reservations for CASTANYOLES by calling during normal business hours + 57 1 325 7900. International rates may apply. Appearing as No. 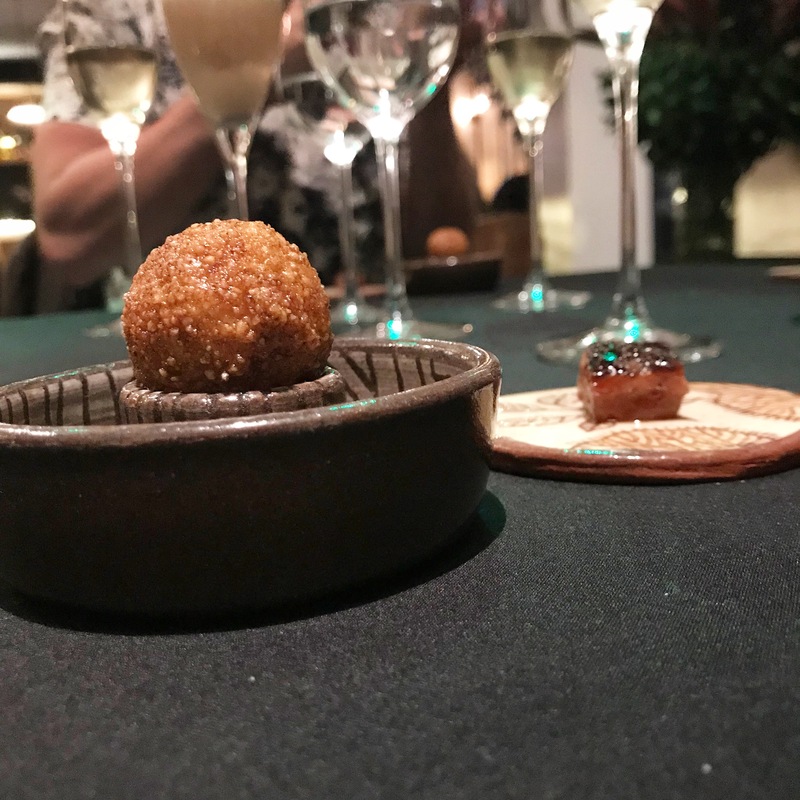 18 on the coveted Latin America’s 50 Best Restaurants List for 2017, this 16-course tasting menu articulated by Chef Leonor Espinosa and her daughter Laura, left us intrigued and in awe. This mom-daughter duo are the most lovely, warm and welcoming team in the kitchen. They personally came out and greeted us before the night commenced. Chef Leo received the ‘Best Female Chef Award’ for 2017 and we are so happy for her massive success as she is paving the way for the future generation of chefs and entrepreneurs alike. ‘River lobster, mandarin lemon, pepper & coconut milk’ prepared by Restaurant LEO. pictured left: ‘Smoked rabbit croquette’ with yucca, manoco, tucupi, Carribean sour cream | pictured right: ‘Tuna, Santander ants, long pepper, pigeon & molasses” | Chef Leonara Espinosa showcases her knowledge of Colombian ecosystems and culinary mastery. Make reservations well in advance by visiting restaurantleo.com. You may consider securing your dinner reservations before booking your flight and hotel. Everywhere in Colombia, the coffee is superb. At the Masa cafe, order an ‘Americano’ or whatever gets your blood pumping and opt for a ‘danish pecan and caramel crumpet’ as you settle in to enjoy a casual brunch made to order. May we recommend the ‘Croque-Madame’ sandwich with Jamón ibérico, queso gruyere, huevos fritos and salsa. We did not make reservations. Walk-in’s are typically fine. Pre-dinner detour! Usually we would arrive to the restaurant a little early and grab a glass of wine ahead of dinner, but not this time! So why did we take this detour? We learned about the game of Tejo through Anthony Bourdain, Parts Unknown. It’s an old tradition in Colombia that involves beer and explosives. 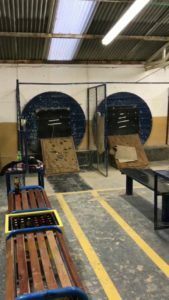 Similar to corn-hole in the United States only louder and a lot more exciting! Little triangular packets called “mechas” are filled with gunpowder for scoring. Four mechas are placed around a bullseye made of clay and if you hit one of them with the “tejo” (weighted disc), it explodes as the gunpowder ignites (it’s safe, don’t worry!) In Colombia, only soccer has a larger following. Build in 2.5 hours ahead of your dinner reservation to play the game for 2 full hours and then give yourself the additional 30 minutes to deal with traffic. Suggestion: wear comfortable and dark colored clothing that’s versatile enough to go straight to dinner, ‘smart casual’ is the way to go. Note: Your hands are going to get a little soiled from touching clay, but you will stay entirely clean, and your clothing will not be compromised. This is a game you’re not going to want to miss ahead of dinner. It’s so damn fun, you’ll thank us later, not to mention that you’ll work up an appetite just in time for dinner. Reservations where not necessary, we went right when they opened at 5 PM on a weekday. Formerly ranked as a Latin America’s 50 Best Restaurant in 2013, 2014 & 2015, CRITERION was something we had to see for ourselves. 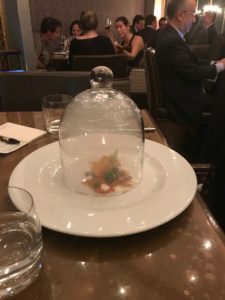 Making the coveted list is so wonderful for aiding a restaurant to gain exposure and pick up momentum, but it only makes sense for ranked restaurants to eventually rotate off of the list making room for new chef-innovators to receive accolades. We were not disappointed! CRITERION is the flagship restaurant of the Rausch brothers (Jorge, Mark & IIan) and an important party of the history of haute cuisine in Colombia. We enjoyed a 10-course tasting menu while selecting an additional dish of ‘Foie Gras PB&J’ from the a la carte menu. To make matters even more interesting, we opted for both cuts of protein (one braised beef & one strip loin) so we could experience both preparations. ‘Smoked trout with potatoes in 3 different textures’ Course 3 of a 10-course tasting menu at CRITERION. We ended on a high with this marvelous dinner at CRITERION. From the excellent service to the well paced courses, we were pleased with this choice of venue. For reservations at CRITERION click here. You can never go wrong with ‘smart casual’ and that’s exactly what we opted for with all of our sit-down dining adventures, (we did, however, pull out the dress and blazer for Restaurant Leo) Given there’s no real dress code – come as you are and stay as long as you want – it’s the Colombian way! Historically, Bogotá has been under-appreciated as a culinary stop on the food-map, but that vision is changing as the city is vastly becoming a destination for food-lovers (like us!) from around the world. We travel the world in pursuit of excellence and we are here to tell you that the absolute best cuisine and best experiences do not merely reside within the United States and Europe. South America rivals both North America and Europe in terms of gastronomic excellence. Some of our most fulfilling endeavors and highest standards of ‘fine dining’ have been transacted in Cusco, Lima & Bogotá. There is so much soul in South American cooking, that we can’t go anywhere else and be quite as satiated (well maybe to Bilbao to see Chef Josean Alija and Eneko Atxa). Through our travels, we have discovered that Latin and Spanish cultures have a way of seducing the heart and stomach. Don’t believe us? Go see for yourself. Check out the 2017 Latin America’s 50 Best Restaurant’s List ( here ) and use it as a guide when planning your trip. The goal for us each time we travel is to experience the unique flavors of the local ecosystem while engulfing ourselves in the culture. Through eating, drinking and interacting with the locals, we can get a feel for how they live. We enjoy gastronomy because narratives surrounding food showcase the history of a city and its people. We also love lessons in humility, which often our brothers and sisters in other nations provide along the way of fresh perspective. The choices we made with our Bogota itinerary enabled us to achieve these objectives. We are still reeling in the excitement of all that Colombia has to offer! The fine dining experience is on par with the best restaurants across the world. Food-adventurers who love Lima, Peru for example will also love ‘Zone G’ of Colombia. If you’re by chance traveling from the USA, there’s no jet lag, the dollar is strong and the flight is relatively short (as compared to flying to Europe, Africa, Asia or Australia). It only makes sense to head due south and meet your fellow Americans! ⇒ Won’t you make Bogotá your next food-destination? Download our travel e-book. We share secrets for how to travel the world and eat famous. Your descriptive voice makes feel like I’m there tasting those delightful dishes!